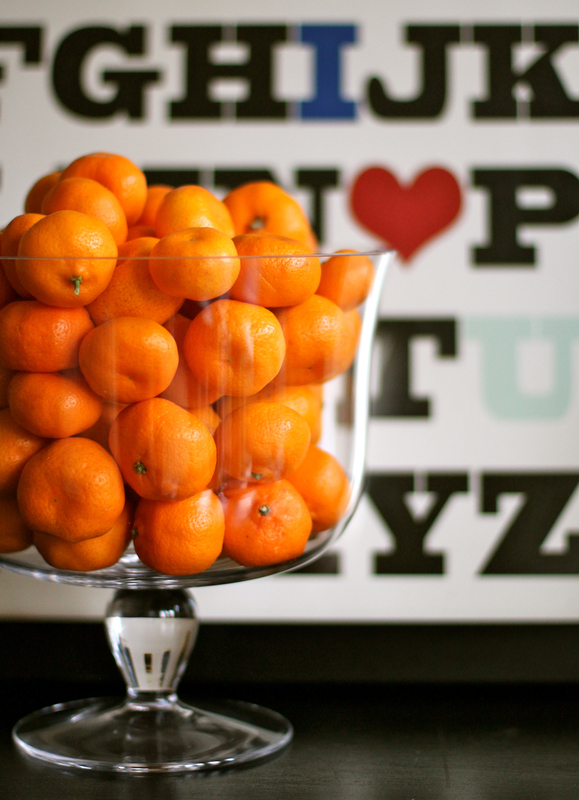 Fresh mandarins piled in a pretty container help ring in the New Year in style. When I was a kid, January felt like the most depressing month of the year. Christmas was over and with it, the endless parties, treats, and gifts. Our house felt barren and empty, the tree, lights, ornaments, and holiday decorations packed safely in their boxes and stored in the basement. With all of the glitz and glam packed away until next year, it was hard not to feel lonely for the recent past, or very distant future, of the holiday season. “Winter blues” was not a label I was familiar with as a kid but understand now as an adult. After a month spent in a frenzied state, the January routine is bound to feel like an abrupt reality check, and even more so when you’re a kid. To kick off the new year, I’d like to share a piece I wrote last January for a writing class I had enrolled in. I’ve found a way to ring in the new year and embrace the “winter blues” with brilliant hues of orange, health, vitality, and sweetness. All it requires is a trip to your local farmers market (or grocery store), and an appreciation for the bounty of the changing season. It’s going to be my new year’s tradition, and I hope it becomes yours too. Happy 2014, dear readers. It’s going to be one delicious year! January is not my favorite month. In fact, January may be one of my least favorite times of the year, with promises of blustery winds and dry skin, shriveled tomatoes that have not known the warmth of summer for months, and bare tree branches no longer twinkling with the lights from the holidays. Coughs and sniffles interrupt conversations, and thwart dinner plans when they develop into full blown sickness. We’ve traded endless parties and holiday treats with resolutions that typically involve cutting back on sweets and exercising more, which more often leaves me feeling deprived, exhausted, uninspired, and sore. And yet as I wandered through the farmers’ market last week, as I do each Wednesday, I was reminded once again why I live to eat, and why the winter growing season is no less beautiful, delicious, or incredible than summer, spring, or the bounty of autumn. The market was overflowing with oranges, almost every stand piled high with brightly-colored orbs, each one bursting more fresh, sweet juice than the next. My eyes feasted on the endless hues of orange, bright neon tones that veered toward the yellow end of the spectrum; others with deeper, more serious tones that bordered on red. Some of the oranges were even mottled with tiny red dots, hinting at what might lie inside. I feel myself in an almost trance-like state, wandering from stand to stand, buying as many different oranges as I can, handing over the money without a second thought. Soon my bags become heavy, too heavy to continue wandering, and I am forced to abandon my weekly errand because my gluttonous habits from the holidays have gotten the best of me . As I walk back to my car, the heavy bags dig into my shoulders and are a painful reminder of my lack of self-control amidst all of this glowing fruit. I arrive at home with my bounty of juicy, orange-hued treasures, hoping that all this beautiful fruit will bring a sense of life and health and wellness into our home. In early January, winter seems to infiltrate the house with its chill. The holiday decorations have been put back into the garage, the gorgeous pine tree has gone out to the curb, and all the lights have been stowed away until next year. Holiday cards no longer fill up our mailbox and family has returned to their homes and separate busy lives, leaving our house feeling barren and quiet. Does something as simple as a seasonal fruit really have the power to transform the energy of a home? I like to think so, or at least hope for my own sake because I bought so many oranges! I bring in the bags and pile them on the kitchen counter. Then I begin my search for all the beautiful bowls that populate our cupboards. I begin to pile the navel oranges into the footed antique bowl that I hunted down at a local flea market, the swatch of rust on the bottom side of the bowl provides an interesting counterpoint to the freshness of the orange rind. The satsumas are next, their wrinkly skin and still-attached leaves are begging to be nestled into a shallow bowl where they can be plucked and eaten as a snack in front of the television, or grabbed as a sweet treat on the way out the door. The mandarins find their home in a bowl that was handmade in Italy, with a blue and yellow design that highlights their beautiful deep orange hue. Cara cara oranges are my next target with their lovely orange-pink skin, which hints at a similar but deeper pink-hued flesh. The cara caras get piled in my beloved wooden salad bowl, hand carved from a single piece of found wood and given to my husband and me as a wedding gift. It is one of my favorite treasures, and is a perfect resting place for the pink-hued fruits. I continue unpacking the bounty of my morning excursion, and then strategically place the bowls all over the house; in the kitchen, on the buffet, resting on the coffee table. Immediately our house comes back to life, not with the decadent, celebratory energy of the holidays but with the hopeful, healthful energy of the new year. Orange has taken the place of red and green and gold, and brought a sense of life back into our home. The pops of brightness catch my eye and beg for my attention, ready to be plucked from their bowl and peeled for an afternoon snack, squeezed into a glass of juice, or trimmed of their beautiful rind and plunked into a healthy fruit salad. The oranges are the perfect swap for the parade of cookies I indulged in each afternoon in December, their natural sweetness and brightness not competing with buttery, sugary holiday indulgence but a delicious reprise, juicy, spunky, and full of flavor. The health properties of oranges are no secret; they are full of vitamin C, antioxidants, and other compounds that fight off the common cold that is all too common at this time of year. Perfect, beautiful, life-giving health in the palm of my hand. Can a simple piece of fruit transform a home, heal a body, and brighten the dark days of winter? I believe it just did. Sometimes life often gives us exactly what we need. And in this moment, what I need is a bright, juicy orange.